Grand Celebration is a throwback to old-school cruising, drawing on many of the concepts that make longtime cruisers nostalgic -- set-seating dining, steel drum bands and midnight buffets, to name a few. But that also means passengers have to do without over-the-top amenities like ice-skating rinks, high-diving acts or ziplines. For those who have never cruised before, Grand Celebration gives passengers a sense of what ocean cruising is all about. Live nightly entertainment, several pools and hot tubs, a casino and children's clubs are enough to keep passengers entertained for two nights (though it's a good thing longer cruises are not on offer). Prices are low, and schedules are flexible, making them ideal for short, last-minute getaways. Smaller ship size means limited options for entertainment and dining. Casual, unpretentious, relaxing and cheerful fun for all ages and budgets. There is a constant reminder that yes, you are on vacation and the tropical cocktails are flowing. The easygoing staff keeps it real: they crack lighthearted jokes and even tease cruisers a little -- without being offensive. Cocktail waiters repeatedly make their rounds at the buffet tables touting Bahama Mamas, while pool parties, live music and drink specials set the tone for a two-night getaway to Grand Bahama Island. Everyone -- kids and adults -- are simply hanging out and having a good old time. Don't get us wrong: Dinner in Stellar Prime or the Admiralty Club will feel like an upscale affair, in stark contrast to the more fun, colorful (albeit mildly tacky) vibe on the outdoor decks. There are other surprises on such a casual ship, as well, such as the knowledgeable sommeliers in the dining rooms, an elaborate spa menu, spacious accommodations and welcome-back cookies, water and juice offered to passengers reboarding after a day ashore. Overall, Grand Celebration might lack that "wow factor" many cruisers look for these days, but that's not what this ship is about. Instead, it is a comfortable and easy getaway to the Bahamas, and is a great choice for both families and couples. Despite having all the main gathering spots on the top decks, Grand Celebration doesn't feel overly crowded. Nor is there any type of class system onboard; all passengers can access the same areas of the ship, so no one is privy to a special lounge simply because they booked a more expensive cabin. It seems like everyone is onboard to have a good time -- even the crew, who seem more at ease than on other ships on which we've sailed. With only one ship in its fleet, Bahamas Paradise Cruise Line is able to focus more heavily on customer feedback to improve the onboard experience, and it shows. Service is standard -- on par with what you'll find on other cruise lines, but everyone -- from room stewards to officers -- is eager to ask about your day and how they can help to make your sailing better. It's important to note that, even though Grand Celebration is the only ship to sail from the Palm Beach cruise terminal, embarkation can still be a little messy. Onsite parking is plentiful and reasonably priced, but it comes with mandatory valet service, which can be slow. There are no porters outside the terminal building to receive your bags. Instead, you'll take your own luggage through security and then check it via a painfully manual system that involves two workers at a table with printouts of every passenger's name and cabin number. Passengers can extend their stays in the Bahamas for two, four or six nights at the Grand Lucayan resort and disembark the ship for several days before boarding the vessel again to return to the Port of Palm Beach. Although most passengers choose the two-day cruise option, the resort add-on is reasonably priced and the cost includes spacious accommodations, food and drink, and access to a gorgeous pool and beach. Grand Celebration draws a mixed group of international and U.S. passengers; the time of year can also attract different crowds. During school holidays, expect a number of families with children; in March, cruisers might be joined by college students on spring break. In general, the age of Grand Celebration passengers tends to be younger than other ships (late 30s to early 60s), and there is a friendly atmosphere onboard. Many Florida locals -- particularly those who are frequent gamblers (the line has a robust casino loyalty program) -- use the ship as a weekend getaway, so there are numerous passengers from the Latin community; to that end, a special orientation is held in Spanish when passengers first come aboard, and all announcements are done in both English and Spanish. 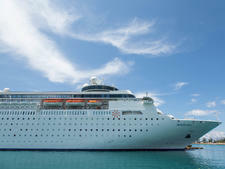 Although most people choose the two-day cruise option, some passengers disembark in Freeport for a few days, thanks to the cruise-and-stay package, so there will likely be some new faces on the return voyage from Grand Bahama. You might also encounter newlyweds or soon-to-be-married couples on your sailing. The line's cruise-and-stay packages are catching on with people looking for affordable destination weddings that make use of the Grand Lucayan's convention center and gorgeous, oceanfront Great Lawn. Cruise Critic’s professional photographers and our extraordinary community members have taken 1,375 pictures of Bahamas Paradise Cruise Line Grand Celebration. When you visit our photo galleries, you can be assured that what you see is what you get. During the day the attire is extremely casual, so don't be surprised to see a number of people wandering the ship in their swimsuits (although technically the dress code requires shirts and shoes). The Admiralty Club (specialty restaurant) and Stellar Prime (main dining room) have an "elegant" requirement for men: long pants or dressy jeans, and collared shirts. Jackets and ties are optional, but no flip-flops are allowed. Most folks dress up a bit in cocktail dresses and nice blouses during the evenings for dinner and entertainment, but nothing too over-the-top. The Voltage Nightclub also has a dress code of no shorts or flip-flops. A $12 per person, per day, charge is added to the bill for housekeeping services. Onboard accounts can be opened using all major credit cards, traveler's checks or cash (U.S. dollar is the accepted currency). A 15 percent service charge is automatically added to onboard accounts for spa services and purchases at restaurants and bars (cocktails, beer, etc. ); however, additional gratuities can be added at passenger discretion for outstanding service. Drink packages (soda, alcohol, mineral water) that can be purchased before boarding or on the vessel are still subject to the 15 percent charge. A blend of old-school cruising fun and modern amenities on a beautiful ship, sailing short two-night cruises to the Bahamas and back.